Now STC approved for installation in type certificated aircraft. Dynon Avionics' best-selling EFIS-D100 is now STC approved for installation in type certificated aircraft. Over 15,000 experimental and LSA aircraft already fly with Dynon glass panel products. Based on this success, the EAA, FAA, and Dynon partnered to gain FAA approval for the installation of Dynon’s EFIS-D100 in type certificated GA aircraft. 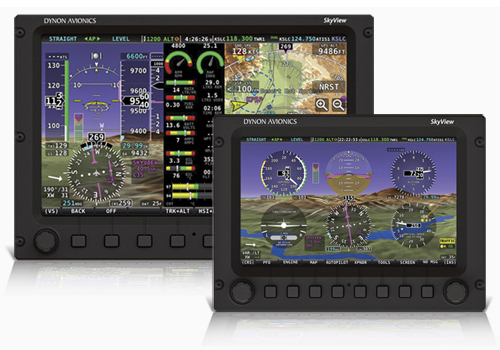 Dynon’s first STC’d products are the EFIS-D10A and EFIS-D100. The EFIS-D100 is the only 7” widescreen PFD available for type certificated aircraft. The product feature attitude, airspeed, altitude, turn rate, inclinometer, g-meter, up/down timers, clock, and voltmeter. Battery backup provides power in event of aircraft electrical system failure. Other optional capabilities include angle of attack, magnetic heading, OAT, true airspeed, winds aloft, and density altitude. The initial STC allows the EFIS-D100 to replace the existing primary attitude indicator in many Cessna and Piper aircraft with a modern EFIS that contains no moving parts. More aircraft approvals are expected to follow. The STC is available for $100 from the EAA. 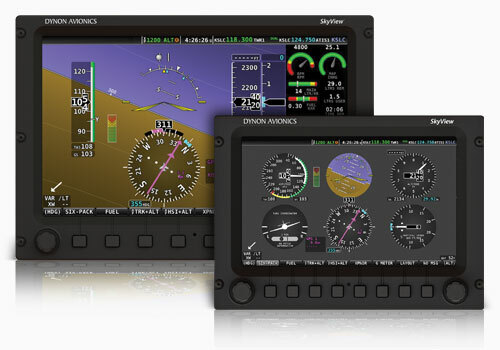 Dynon sells the EFIS-D100 and related accessories directly and through dealers. Unique to this STC, EAA, Dynon, and the FAA worked together to allow the EFIS-D100 to be installed without the traditional Technical Standard Order (TSO) or Parts Manufacturer Approval (PMA) requirement. Dynon’s product is also verified against the recently developed ASTM 3153-15, Standard Specification for Verification of Avionics Systems. The EFIS-D10A was flight tested in Oshkosh earlier this year in an EAA Cessna 172M. The EFIS-D100 is the same commercial products that have been available to experimental and LSA customers for years. The EFIS-D100 was discontinued in January 2019. Although eligible EFISs and accessories are bought from Dynon and its dealer network, the STC itself is owned and distributed by the EAA. The EAA’s pricing for the STC is expected to be announced by EAA Monday, July 25th at the start of AirVenture. EAA expects to take STC orders at AirVenture, with fulfillment commencing after the show. How am I able to put a Dynon EFIS-D10A or EFIS-D100 in my type certificated aircraft? The EAA, FAA, and Dynon combined their expertise to enable the installation of commercially available avionics systems into certain type certificated GA aircraft. Based on the success of our proven product development process in the experimental market, the FAA is authorizing STC installation of a Dynon EFIS as a replacement for the primary attitude indicator in small GA aircraft. The EAA — with Dynon’s help — developed the STC. Customers buy the Dynon EFIS from their Dynon dealer/installer and the STC from EAA. Like any STC, installations must be signed off by an A&P with Inspection Authorization (IA) and will require an FAA form 337. What is the pricing and availability of the EFIS systems configured for these applications? What is the pricing of the STC? The STC costs $100, and is available from EAA. Dynon Avionics is the leading producer of avionics for Experimental and Light Sport Aircraft, with over 15,000 aircraft equipped all over the world. The EAA chose Dynon for this STC because of its proven success in the market. Dynon’s product line spans from the D2 portable attitude indicator to its fully-integrated SkyView system. The EFIS-D10A was one of the first products Dynon released, with thousands installed and flown since 2004. Why do I buy the STC from EAA and not Dynon? The EAA’s relationship with the FAA was key to this program’s success. The EAA, with Dynon’s help, developed this novel STC approach. Dynon is the launch partner for this STC process. What aircraft are approved under this STC? To confirm that your particular aircraft model and type certificate is eligible, check the EAA STC Approved Model List. Your aircraft must have been equipped with a pneumatically driven attitude indicator at time of manufacture to be eligible. Is the EFIS-D10A / EFIS-D100 TSO’d? Does Dynon have PMA? No. This STC demonstrates that Dynon commercial products are suitable for use in type certificated aircraft. Neither TSO nor PMA are required to allow the EFIS-D10A to be installed in aircraft covered by the STC. What is the pedigree of the Dynon EFIS products? EAA and Dynon successfully demonstrated that Dynon’s commercially-proven manufacturing and development process yields a product that is suitable for use in type certificated aircraft. The Dynon EFIS-D10A and EFIS-D100 are also verified against the recently developed ASTM 3153-15, Standard Specification for Verification of Avionics Systems, which Dynon Avionics was instrumental in creating. Will the Dynon EFIS fit in my panel? The 7” EFIS-D100 is 6.95” wide x 4.90” tall x 4.51” deep. The STC allows the EFIS-D10A or EFIS-D100 to replace your primary attitude indicator. It can also be installed as a second attitude indicator in aircraft that already have one installed. The EFIS-D10A requires power, pitot, static, Dynon’s GPS-251 Receiver/Antenna, an internal backup battery, and optionally Dynon’s AOA probe, remote magnetometer, and OAT. Will the EFIS-D10A or EFIS-D100 fit in my panel? In a Cessna 172, the EFIS-D10A occupies a slightly larger area than the space available when a conventional attitude indicator is removed. This requires a new subpanel with slightly different spacing. Initially, this will depend on the installer’s rates and experience. The EFIS-D10A was originally designed to be installed by aircraft homebuilders with minimal experience, so professional installers will be impressed by how easy it goes in. The aircraft that EAA used for FAA acceptance tests was converted to the STC configuration, test flown, AND converted back to its original form all in just days. Some aircraft will need to have existing instrument spacing modified. This will require a new panel. STC installations ultimately require approval from an A&P with Inspection Authorization (IA), and will require an FAA form 337. Aircraft owners who work on their aircraft under the supervision and approval of an appropriately rated mechanic could apply this STC to their aircraft in that manner. When will the EFIS-D10A, EFIS-D100, and associated STC be available? The STC is available now from from EAA. Eligible Dynon products are currently available from Dynon and its dealers. Do the EFIS systems that can be installed in a type certificated aircraft have the exact features as the EFISes available for the experimental market? They are the same product and have the same capabilities. However, there are some features that are not currently approved for use in type certificated aircraft. One of these is autopilot. How does the installation affect the Weight & Balance of my aircraft? Typically, installing an EFIS-D10A changes the aircraft weight by less than 1 lb. The Dynon EFIS will not fit in my panel. What can I do? You must maintain the “six-pack” orientation of your existing primary flight instruments. In other words, you can not rearrange them. You may, however, use a new panel to change the spacing to accommodate the EFIS. Installing the magnetometer or OAT will be hard in my aircraft. Do I need to install them? You can choose to not install the magnetometer and/or OAT (the OAT connects through the magnetometer). In these installations, the EFIS-D10A will not be able to display magnetic heading, OAT, or winds. Note that your aircraft’s existing magnetic compass must remain in the aircraft regardless. This EFIS has a lot of capability. All I want is an attitude indicator. All of the other functions that the EFIS-D10A can provide are supplemental in nature. Strictly speaking, the EFIS-D10A is a replacement for your attitude indicator. All other capabilities, such as airspeed and altitude, can be suppressed. All of your other primary flight instruments are required to remain in your aircraft. There is a GPS receiver/antenna for the EFIS, but there are no mapping functions in the product. What is the GPS for? The EFIS-D10A’s attitude algorithm is normally aided by pitot-based airspeed information. If the EFIS-D10A’s airspeed source gets blocked, the EFIS will automatically use GPS ground speed to continue to display accurate attitude. The GPS antenna must be connected in an STC’d installation. Is there a gyro inside the EFIS? There are no moving parts or a conventional “gyro” in the EFIS-D10A or EFIS-D100. The attitude-sensing platform uses modern MEMS rate sensors and accelerometers. Will the EFIS be damaged by aerobatics or unusual maneuvers? No. The sensor platform inside of Dynon avionics is able to align only seconds after power up on the ground, and within 15-30 seconds in the air. Most aircraft cannot exceed the EFIS’s rate limits of 150 degrees per second of attitude change. If you do, the EFIS will automatically go into a self-recovery mode and re-align after a short period of straight and level flight — typically within 15-30 seconds. I’m not in the US. Can I install a Dynon EFIS in my type certificated aircraft? The FAA STC currently applies to aircraft governed by FAA regulations. Can I add a Dynon EFIS to an aircraft that was not originally shipped with -- or does not have -- an attitude indicator? Not under the STC, but contact the EAA and they may be able to work with you on a field approval. Can I add an additional EFIS-D10A to replace my DG/HSI? No. Right now the STC only allows the EFIS-D10A to be used as an attitude indicator. However, you can add a second attitude indicator elsewhere in the panel if you’d like. The STC does not restrict the number of attitude indicators installed in your aircraft. 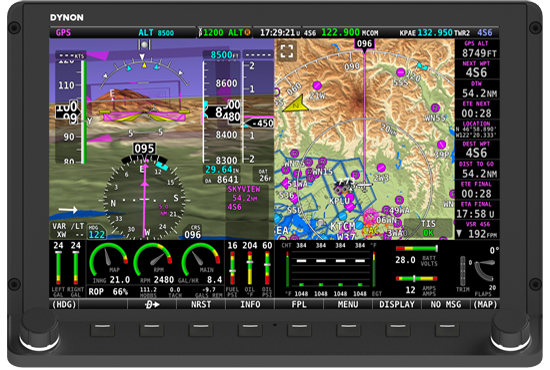 The EFIS-D100 features a 7" diagonal, color LCD which boasts the highest resolution in its class. The stunning display enables split-screen viewing to augment the primary EFIS data with other pages of information called up by the pilot. Six buttons arranged along the bottom of the screen serve as the interface to the softkey-driven menu system for easy access to in-flight functions and setting pilot preferences. Dynon's advanced ADAHRS (Air Data, Attitude and Heading Reference System) integrates over a dozen solid-state sensors that deliver exceptional performance and reliability. With the exception of the remote compass, the ADAHRS is built inside the EFIS-D100 instrument housing, saving installation time and space. Each ADAHRS undergoes a rigorous calibration regime at the factory to ensure accuracy over its full operating range. Unlike mechanical gyros, Dynon's rugged design is tolerant to aggressive flight maneuvers, automatically corrects itself anytime its gyros' capabilities are exceeded, and cannot be damaged by aerobatics or unusual attitudes. Dynon's EFIS-D100 utilizes an embedded, multi-processor design that delivers real-time performance and stability. This purpose-built design is unencumbered by burdensome operating systems that typically slow down performance and require long boot times. Dynon's software design enables complete control to maximize execution speed and deliver robust reliability. A hallmark of the EFIS-D100's performance and a great safety feature is its ability to display the correct attitude within a few seconds of being powered on while in flight. A unique safety feature available from Dynon is its optional AOA/Pitot that combines Angle-of Attack (AOA) and airspeed sensing into a single pitot design. The AOA capability assists pilots on approaches and generates an alert signal for audible annunciation whenever nearing stall conditions. This pitot is available in heated and non-heated versions. To guard against a power failure scenario, the EFIS-D100 may be optionally equipped with a Li-Ion Backup Battery. When power loss is detected, the instrument will automatically notify the pilot and immediately begin running on battery power for a minimum of 1.5 hours, enabling a safe landing. The EFIS-D100 is equipped with a PC serial interface which provides the capability of uploading up to 25 user-defined lists for use as checklists, aviation data or other information that pilots wish to keep handy. 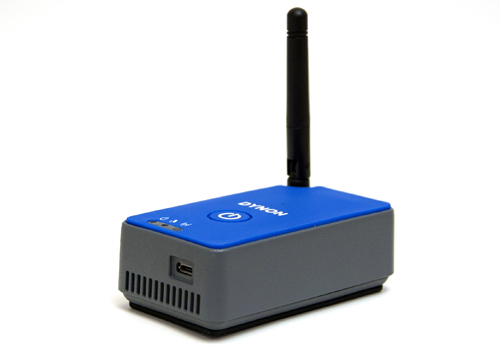 The PC interface additionally facilitates downloading free firmware updates from Dynon's website. Cockpits equipped with more than one type of Dynon instrument can benefit from the connection capability that comes via the Dynon Smart Avionics Bus (DSAB). When linked via DSAB, pages displayed on one instrument may be shared for display on other Dynon instruments. DSAB not only allows you to share the fun with your co-pilot but delivers Dynon generated data directly to the instrument in front of you whenever you call upon it. Dynon has developed a series of expansion modules that add new capabilities and functionality to its existing line of D10/D100 Series EFIS, EMS and FlightDEK avionics. These optional modules provide exceptional value and performance while preserving the affordability of Dynon's existing equipment. This modular concept promotes greater flexibility when configuring new aircraft panel systems and facilitates future expansion if so desired. Each expansion module is network connected to its line of avionics via the Dynon Smart Avionics Bus (DSAB). This two wire connection not only simplifies wiring but can extend individual module benefits to multiple interconnected Dynon instruments. Attitude: Automatic recovery from rates greater than 150 degrees per second in roll, pitch and yaw. In-flight start capability.